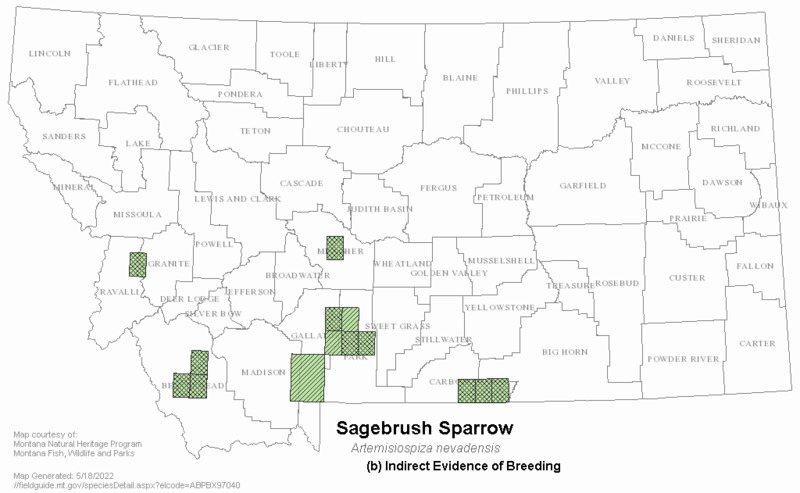 The Sagebrush Sparrow breeds throughout sagebrush habitats of western North America. Its distribution in Montana is limited to localized populations in southwestern and south-central Montana. This inconspicuous sparrow is often overlooked because it spends much of its time running along the ground between shrubs, often with its tail raised in the air. In Montana, adults arrive on breeding grounds beginning in late March. Nests with eggs have been observed in mid-June and fledglings have been observed as early as late June through mid-July. It has been recorded in Montana as late as September 1. The Sagebrush Sparrow is a medium-sized, brownish-gray sparrow with a gray-brown head, thin white eye ring, a white spot in front of eye, and a broad white mustache stripe above a dark mustache stripe. The back is buffy-brown with dusky streaks. The underparts are white, with a central dark spot and dusky streaks on the sides. The outer tail feathers have a thin white edge. Juveniles are duller and more heavily streaked. Males and females are alike in plumage (Martin and Carlson 1998). 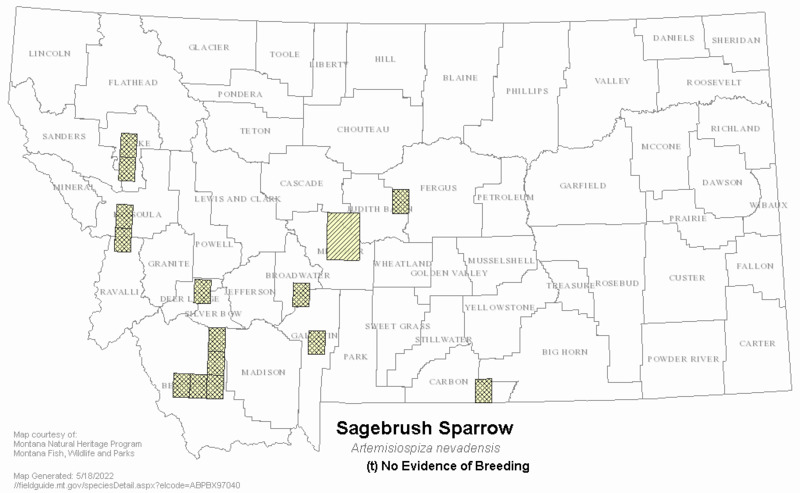 The Sagebrush Sparrow occurs in contiguous areas of Big Sagebrush, primarily in the southwestern and south-central part of the state. This species prefers tall, dense stands of Big Sagebrush with high vertical and horizontal heterogeneity. In migration, the Sagebrush Sparrow does not appear to be restricted to sagebrush habitats and will use a variety of open habitats (Rich 1980). Juveniles and adults may form small flocks in late summer before migration (Martin and Carlson 1998, Montana Natural Heritage Program Point Observation Database 2016). 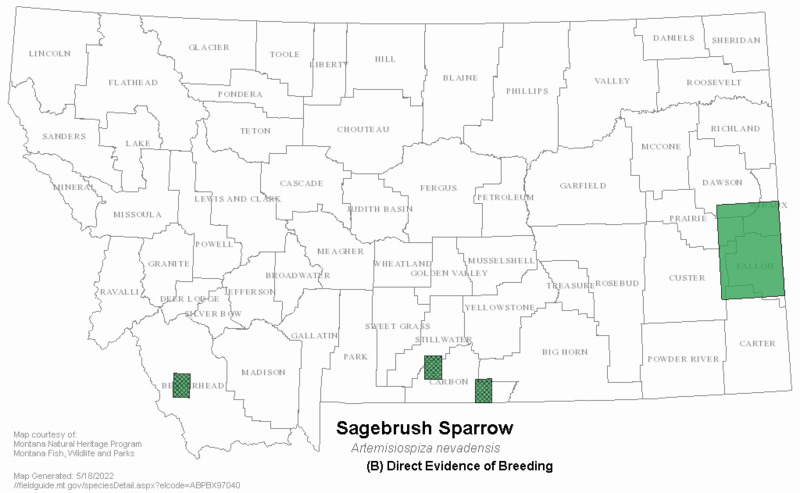 The Sagebrush Sparrow breeds in large, contiguous areas of Big Sagebrush or in sagebrush-saltbush habitats and does not typically occur in seral stage or patchy shrubsteppe (Hansley and Beuvais 2004). Occurrence of the species is positively correlated with sagebrush cover, height, and bare ground and negatively correlated with grass cover (Wiens and Rotenberry 1981). This species prefers to nest in the interior of sagebrush stands and avoids edges (Misenhelter and Rotenberry 2000). Nests are typically placed in tall, live shrubs within the densest sagebrush stands (Hansley and Beauvais 2004). The Sagebrush Sparrow forages on insects and spiders as well as seeds, small fruits, and succulent vegetation. This species forages on the ground near or under shrubs and may glean arthropods from the lower stems and leaves of shrubs (Martin and Carlson 1998). Territories during the breeding season generally do not overlap, but territory borders can shift slightly from day to day (Martin and Carlson 1998). Nests are typically placed near the center of a large, live shrub, although nests are occasionally placed on the ground (Hansley and Beauvais 2004). Female builds the nest while the male perches and sings nearby. Nest is an open cup made of small twigs or coarse grasses and lined with fine grasses, feathers, fur, or other animal hair. Average clutch size is 3 eggs (range 1-4 eggs). Typically two broods per year. Female incubates eggs between 10-16 days. Nestling period is typically 9-10 days; female broods young. Both parents feed nestlings and fledglings for at least two weeks after the young fledge (Martin and Carlson 1998). 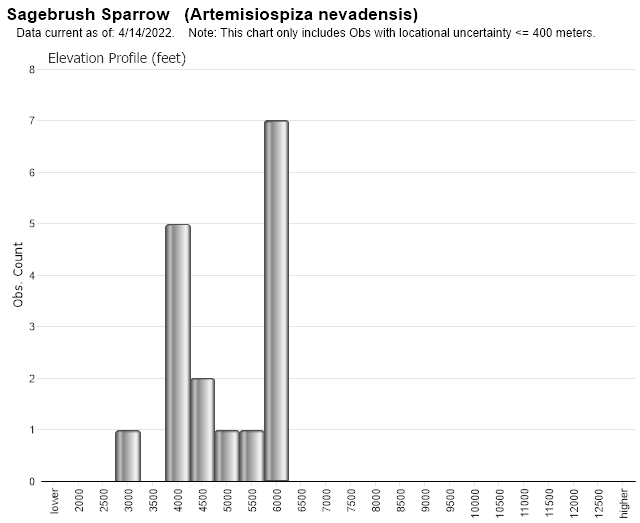 The Sagebrush Sparrow requires large, continuous stands of big sagebrush. Protection and conservation of large, intact sagebrush stands with high structural complexity is critical to maintaining habitats for the Sagebrush Sparrow (Hansley and Beauvais 2004). Loss or fragmentation of intact sagebrush landscapes due to fire, residential development, or conversion to agriculture will reduce or eliminate habitat for Sagebrush Sparrows during the breeding season (Hansley and Beauvais 2004). Hansley, P.L. and G.P. Beauvais. 2004. 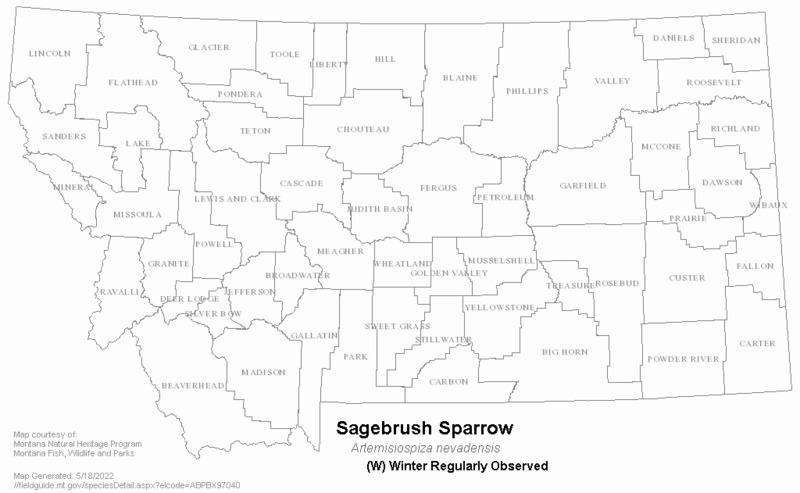 Species assessment for sage sparrow (Amphispiza belli) in Wyoming. Prepared for the U.S. Department of the Interior Bureau of Land Management, Wyoming State Office. Martin, J.W. and B.A. Carlson. 1998. Sage sparrow (Artemisiospiza belli). The Birds of North America Online (A. Poole, Ed.). Ithaca: Cornell Lab of Ornithology. Misenhelter, M.D. and J.T. Rotenberry. 2000. Choices and consequences of habitat occupancy and nest site selection in sage sparrows. Ecology 81:2892-2901. Rich, T.D. 1980. 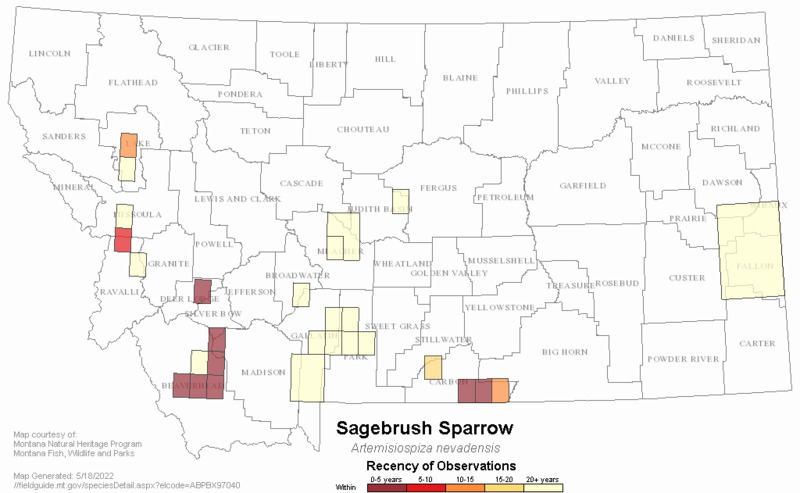 Territorial behavior of the sage sparrow: spatial and random aspects. Wilson Bulletin 92:425-438. Hansen, R. M. 1962. Movements and survival of (thomomys talpoides) in a mima-mound habitat. Ecology 43(1):151-154. Johnson, N. K. and J. A. Marten. 1992. 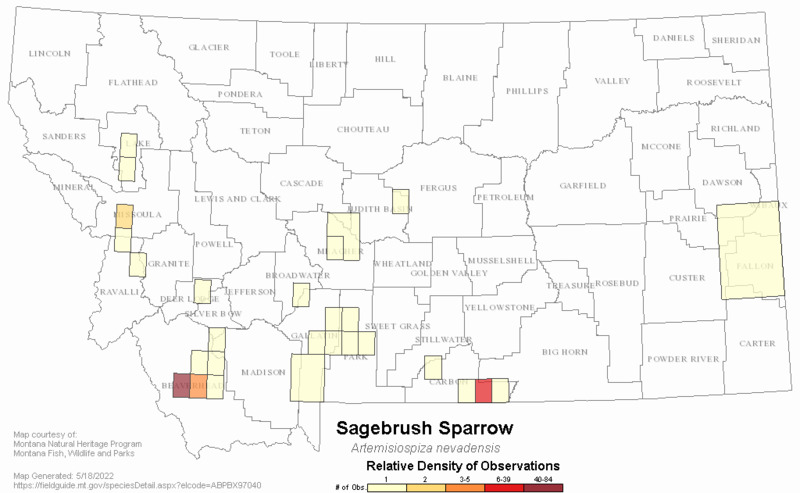 Macrogeographic patterns of morphometric and genetic variation in the sage sparrow complex. Condor 94:1-19. Petersen, K. L., and L. B. Best. 1985. Nest-site selection by sage sparrows. Condor 87:217-221. Saunders, A. A. 1911. A preliminary list of the birds of Gallatin County, Montana. Auk 28:26-49. Web Search Engines for Articles on "Sagebrush Sparrow"